as well as the materials and information needed to create them. and information for creating your own from scratch. There is also complete documentation of the cockpit files, if you wish to make your own. cockpits I'll be happy to add them to the listings, as long as they're family friendly. First rate work, and thanks for putting all that together for us. You're the man Wint, that had to be a ton of work, very nice job. I downloaded em right away, I'll try em out tomorrow. Awesome stuff, Wint! Dang - it's too bad I'm a chase far kind of guy, but the little yard-apes that frequent my house (my son's friends) will love it since they seem to prefer the cockpit view. Drop your phone number in the mod forum and I'll have them give you a call (collect, of course lol) to thank you personally. Knowing that drag racers have no use for the finder that persistently pops up I had planned to make an invisible one just for kicks. I finally did - the ring, pointer and dots are gone, but the number in the center remains. I knew this number would have to be adressed through font changes (such as Cowpod can manipulate for you) but it turns out the speedometer and tach share the same font with the finder number, which means that using a blank font (I have one) to remove the finder number also eliminates the speed/tachometer numbers. Brilliant work Wint. I prefer not to know how much time you spent on this topic, lol. I'm no cockpit guy either (this view makes me seasick) but the one feature I'm defnitely interested in is the mirror. Is there a way to display it in chase view? Good stuff Wint. I'm a cockpit guy and I like the option to change what it looks like inside the cab. Thanks for the hard work you did making these. I prefer not to think about how much time I spent on that topic, lol. The making of it all was the result of following a crazy whim. The project grew larger than I imagined but figuring out various technical things and creating content is the game within the game that I've enjoyed for years. I said long ago this cockpit stuff is probably the biggest waste of time I ever spent on the game, but figuring things out and logging it in webpage form amused me at the time, even if nobody ever read or used it (which I suspect is the case - for the boatload of techinical documentation that is). The truth is that I've always preferred using chase far most of the time with only a little bit of cockpit view now and then (no dashboard/cab). I consider the custom finders the best thing to come out of it all. Still, I did come up with a couple of custom cockpit designs, one of which I still hope to do sometime, but I could never get the other one to work at all (it had a unique steering indicator that the game just wouldn't accept), which ended up derailing me for a long time and delayed the release of everything (which explains Mal's comment above when it was released: "It's about time"). I'm still considering a simple one offering an unobstructed view of the 3D window plus the largest mirror that can fit in the remaining space, with nothing extra to get in the way. Also, I might as well mention that I once made one where the mirror was stretched to fill the whole screen, so that all you could see was where you'd been (the mirror window can be resized freely and it always sits on top of the main 3D window). Rocketalces, to answer your question: nope. I wish. 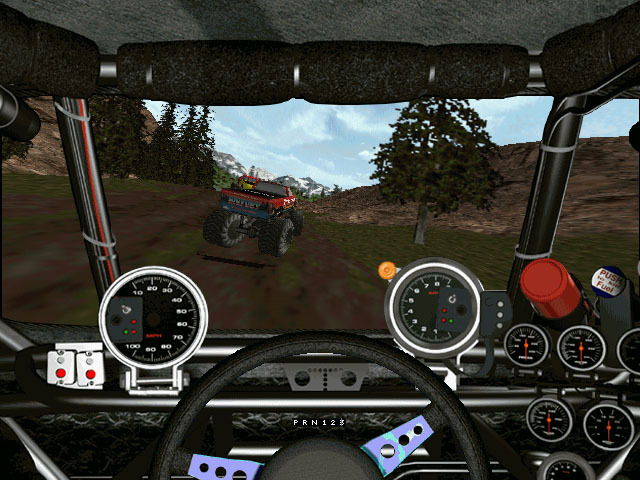 The rear view mirror is only available in the in-cab cockpit view. The cockpit view (in cab, with dash, wheel and gauges) is really very strange and different compared to every other view. The mirror is probably the most interesting bit but there's not a lot you can do with it. 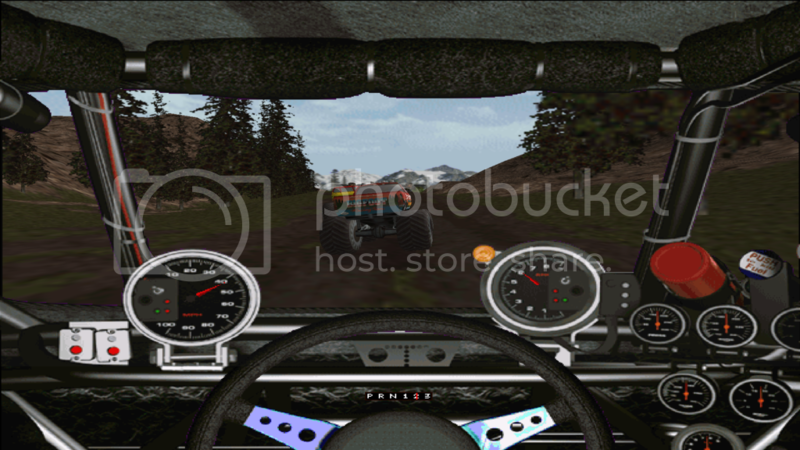 The cockpit window (the 3D view of the game itself) is locked into the strange (squashed) screen resolution of 640x285 pixels and cannot be changed. The maximum height of that 3D window is almost exactly 3/5 of the screen height, which can be raised or lowered vertically to any position within the total 480 height, leaving at least 2/5 of the screen to fill in with the background image (dashboard, mirror, etc). I really don't like it. Can you make a finder that is a bit of a 3D style and built for easy visibility? I dont like small dots and stuff. I liked the idea of shrinking and minimizing the finder elements, which is pretty well reflected in the ones I made, but you can create anything within the limits of the textures sizes. Check out the finder creation notes. The size of the base RAW files is fixed - the 'ring' portion is 60x60 pixels, the 'arrow' portion is 12x6 and the 'dot' portion is 6x6. Create three images of that size in a paint program (or maybe even an icon editor), with a pure black background (which will be transparent), then draw or design anything you can imagine within those tight limits. The transparent finder I posted about recently was nothing more than a group of all black images. I think I pretty well exhausted my own creativity with the batch of finders I made (there are more than what is pictured above) and I've always wondered if anyone else would take a stab at it. Finders are easy to make and assemble but if anyone wishes to supply the graphics (one ring, two dots, two arrows), in .bmp form perhaps, I can convert them into a working finder. Looking at the stock finder you can see the dot is 6x6 - the largest it can be, the arrow is 12x6 - the largest it can be. There's isn't much room to play with there. For increased visibilty of those elements I think you'd have to focus on color contrasts. Great idea Slayer, in fact a whole 'realistic' Trek UI replacement might be pretty cool. That's not a screenshot, I faked a lot of it in a paint program to demonstrate the direction I was headed. It's not likely to ever be made into a working cockpit. The 3D window depicts the largest track view possible using the fixed resolution I mentioned, you can raise or lower it or even overlay it with dashboard elements as much as you like. The mirror reflects a realistic possibility. The gauges can be moved around at will as shown, the finder cannot be moved. As you can see I'm more into surreal than real. Since I had some room at the upper left I thought about adding a plaque or something. My steering wheel is actually the band of LED lights you see at the bottom. The lights would light up progressively as you streer right or left, at least they would if I could have gotten it to work - something about my files would always cause the game to crash (I suspect I exceeded some kind of limits with either the RAWs or the AAIs). daaaaang wint... FIRST RATE WORK MAN IM IMPRESSED! No Rules, No Limits, No Fear!!! Does anyone have all the cockpits? I imagine the files are still around in a backup, somewhere, deep. We can use this links to check how to do(and fix) the cockpits for the Community patch. Hmmm. I will have to look into this. The main reason I didn't do the dashboard is that it has a million parts (ok ok, exaggerating) that are all individual files and each have to be done for each resolution. If it can be shortcuted into only having to work with a few files I will take a more serious look into trying to get the dashboard to work right.